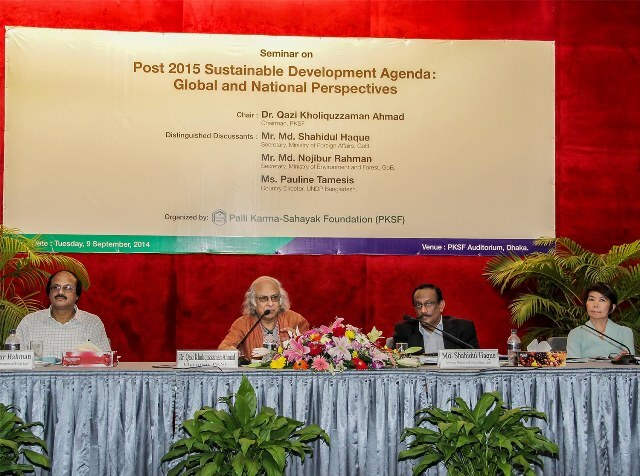 A seminar on “Post 2015 Sustainable Development Agenda: Global and National Perspectives” was held on 9th September in PKSF Bhaban, Agargaon, Dhaka. Mr. Md. Shahidul Haque, Foreign Secretary, Ministry of Foreign Affairs, GoB; Mr. Md. Nojibur Rahman,Secretary, Ministry of Environment & Forest, GoB and Ms. Paulin Tamesis, Country Director, UNDP Bangladesh attented the seminar as distinguished discussants. Dr. Qazi Kholiquzzaman Ahmad, Chairman, PKSFpresided over the seminar. Officials from different Government and Nom-Government Organizations, Development Partners, Partner Organizations (POs) of PKSF, Electronic and Print Media representatives and PKSF officials participated in the seminar. In this seminar, the set of 17 Sustainable Development Goals, proposed by the UN Open Working Group as of July 19, 2014 were reviewed. 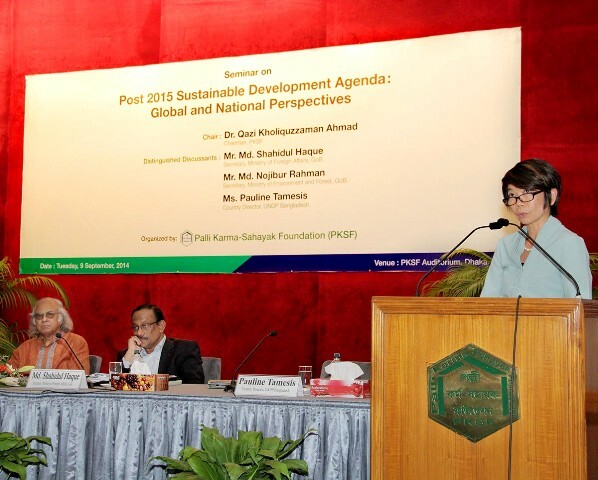 These post-2015 Sustainable Development Goals were determined by taking into account different national realities, capacities and levels of development and national policies and priorities. Also while formulating the SDGs, the foundation laid by the MDGs has been taken into account. Very patient comments were made by the designated discussants as well as by commentators from the floor. The seminaremphasized on participation among government agencies, non-government organizations and other key actors to achieve the goals. A full report is being prepared.